By Chris Williams: Former 8 division world champion Manny Pacquiao (54-4-2, 38 KO’s) intends on coming into his December 8th fight against Juan Manuel Marquez (54-6-1, 39 KO’s) with the form that he once had years ago dating back perhaps at least three years. Pacquiao, who will be turning 34 in less than three months, thinks he can get back to his old fighting ability just training hard. It’s hard to understand how that’s possible when Pacquiao hasn’t looked good since the Miguel Cotto fight in 2009. Pacquiao has had five fights since the Cotto bout and he’s looked steadily worse with each bout. How Pacquiao can get back to the way he fought in the Cotto fight is perhaps impossible. Something happened between the Cotto fight and his fight with Clottey only four months later in March 2010 that changed Pacquiao’s ability to fight at the level he once did. Almost overnight, Pacquiao went from a fighter that was jumping around like a frog to a slow plodder. He’s now at the point where he can’t even fight hard for three minutes. In watching Pacquiao labor around the ring in losing to Tim Bradley last June, how does Pacquiao expect boxing fans to honestly believe that the “Old Manny Pacquiao will return”? Age is hell on fighters, and unfortunately it’s irreversible. 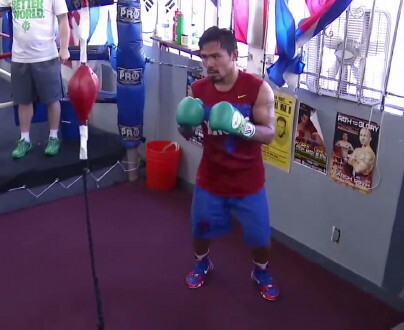 Pacquiao isn’t some kind of Benjamin Button type of individual that ages in reverse. He’s getting older, not younger, and so it’s not likely that he’s going to find his way back to the old Pacquiao no matter how much he talks about it. If his promoter Bob Arum gave him marching orders to say to the media that he’s looking to get back to the old Pacquiao, then I can understand it. Pacquiao would be just playing a part in a large marketing play by parroting the words given to him by Arum. But if Pacquiao honestly believes that he’s going to get back to where he once was physically then I feel sorry for him because he’s going to be disappointed when he finds out it’s unattainable. For some reason, Pacquiao seems a incredibly confident for the Marquez fight; much too confident for the likes of me. It has me wondering if he has feet firmly planted on the ground. Pacquiao should be nervous because the three previous fights he’d had with Marquez, he’s taken a bad beating in each one of them and deserved to lose all of them. He’s not been losing but he sure deserved to lose all of them as far as I’m concerned. Marquez is just the better fighter in terms of boxing skills, and he knows how to beat sluggers like Pacquiao from having fought a lot of Mexican fighters with the same aggressive style early in his youth. Tickets for the Pacquiao-Marquez 4 fight go on sale tomorrow, Friday and will be selling for $1,200, $900, $600, $400, and $200.